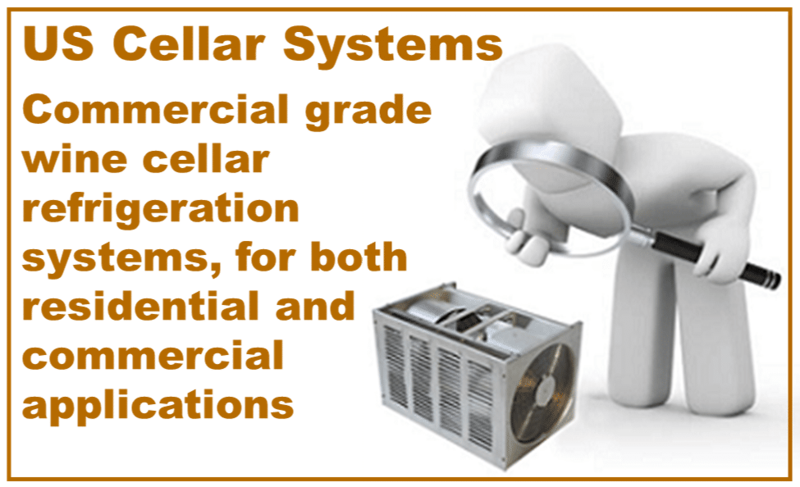 US Cellar Systems is a leading manufacturer of quality commercial grade wine cellar refrigeration systems. They are known for quality, competitive pricing and are ideal for both residential and commercial applications. T hey offer both ductless and ducted cooling options. They are specially developed and engineered to suit the unique needs and requirements of each wine room refrigeration Los Angeles installation project. US Cellar Systems’ residential and commercial wine cellar refrigeration units exhibit innovative style and performance, with a capacity of 1200 Btu to 40,000 Btu (British thermal unit). Split wine cellar refrigeration units from US Cellar Systems are manufactured with custom designed evaporators and condensers, to accommodate the refrigeration requirements of a particular wine storage space. They have seven different lines of split cellar cooler units that provide a range of installation options, promote better air flow, and address any possible constraints and challenges of a wine cellar space. Split wine cellar refrigeration systems are the most effective means of achieving and maintaining ideal wine storage temperature and humidity levels in custom wine cellars. The ability to split the condensing part of the refrigeration equipment from the evaporator coil helps eliminate in-room noise and remove heat exhaust. All US Cellar Systems’ split systems operate on an R134a refrigerant, and require installation through a licensed HVAC/R technician. This comprehensive range of cooling unit types make US Cellar Systems products highly configurable for a wide range of applications. 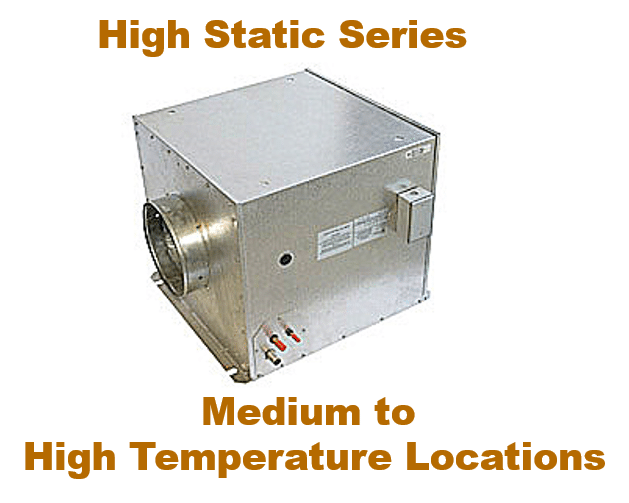 The High Static, or HS, Series is designed to withstand medium to high temperature locations, and can be ducted up to 50 feet away from the wine room refrigeration. This unit can be installed in an attic space, an equipment room, or a roof top. Because of the remote location, equipment noise in the wine cellar is minimized. The HS Series has a cooling capacity of 1,800 to 20,000 BTU per hour. The aluminum housing of this cooling unit is rust-proof and insulated. The motor is thermally protected because of the permanent lubrication. For security redundancy of up to 100%, you may choose to add water cooled condensing units, which can be used for all sizes of wine cellar refrigeration units. 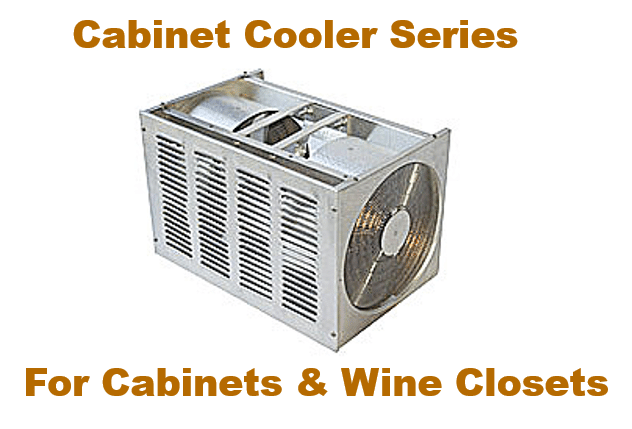 The Cabinet Cooler Series is the perfect option for achieving the best wine storage temperature and humidity in wine cabinets and wine closets. This unit is engineered to reliably cool narrow spaces. This cooling system makes use of a line set, to connect both evaporator unit and condensing unit, and quietly distribute chilled air into the space. It has a cooling capacity of 1,800 to 4,600 BTU per hour. To increase the capacity of the cabinet cooler, we recommend the addition of one to three coils. Other features include hard-tempered aluminum fins, seamless copper tubing, and textured aluminum casing for easy cleaning. 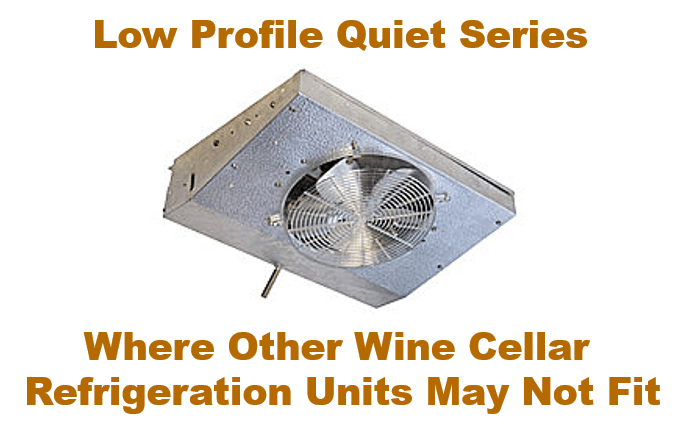 The Low Profile Quiet (LPQ) Series is a ceiling mounted coil, and is the ideal cooling option for custom wine cellars with a unique architectural layout. This unit mounts easily in places where other wine cellar refrigeration systems would not fit, such as a soffit, or in a space above the entryway. It features an angled front that allows for excellent air circulation. The LPQ Series has a cooling capacity of 1,800 to 4,600 BTU per hour. The low profile quiet wine cellar refrigeration systems have fan guards and blades that are designed to reduce noise. Other features include an easily accessible drain pan, factory installed thermal expansion valve, and heavy gauge aluminum cabinet. The Rack Mount Series is mounted horizontally, and features access panels that can be adjusted according to the unique layout and cooling needs of a particular wine cellar space. The removable panels allow for air redirection, which promotes the efficient and reliable cooling of wine rooms. The RM Series can be mounted within the racking frame, and are usually hidden from view with a custom designed louvered grill cover. This climate control unit has a range of 1,800 to 6,600 BTU cooling per hour. 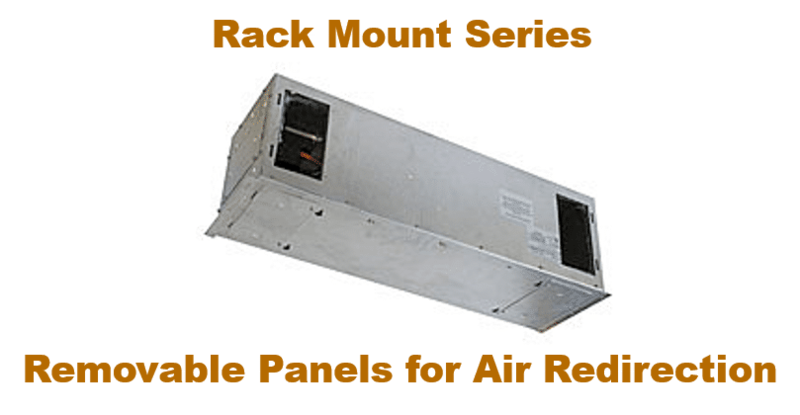 The Vertical Rack Mount Series has the same features as the RM Series. The only difference is that it is mounted vertically. One of the advantages of using this type of cooling unit is that it easily fits into unused corners or spaces of custom wine cellars, and thus allows the full utilization of areas that would otherwise have been blocked off. 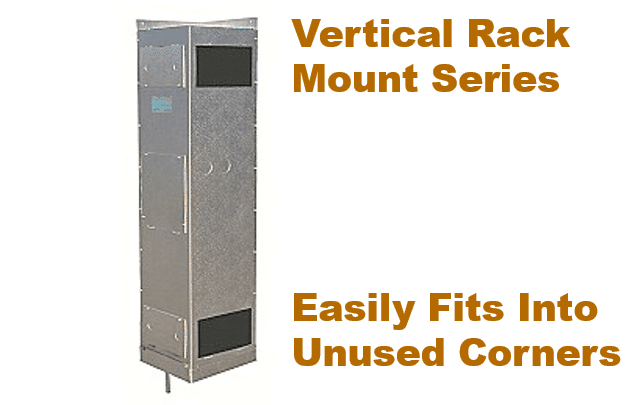 The vertical rack mount cooling units are built with staggered coils with copper tubing that are mechanically expanded into aluminum fins to enhance the performance. The aluminum housing is well insulated and rust-proof. Humidity balance is maintained through the automatic expansion valve, which ensures constant coil temperature. 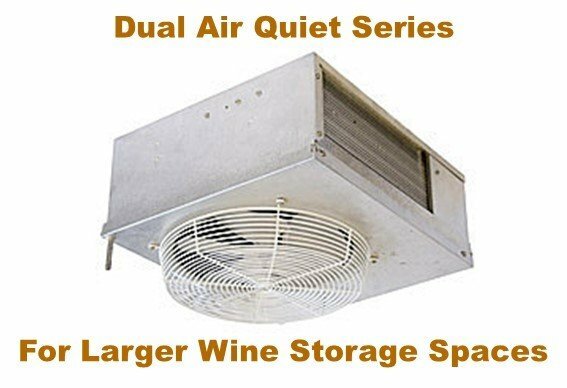 The Dual-air Quiet Series is purpose built for wine storage rooms that are accessed regularly, like commercial wine cellars. This unit is the best cooling option for larger wine storage spaces, and narrower wine cabinets. It features fan blades that are designed to pull air from the bottom, and discharge air up to 12 feet away in both directions. The air defrosting coil of the dual-air series does not require additional heater. The fan blades work with reduced noise, and the staggered coils with high grade copper tubing enhances the cooling performances. The aluminum housing is also rust-proof and well insulated. 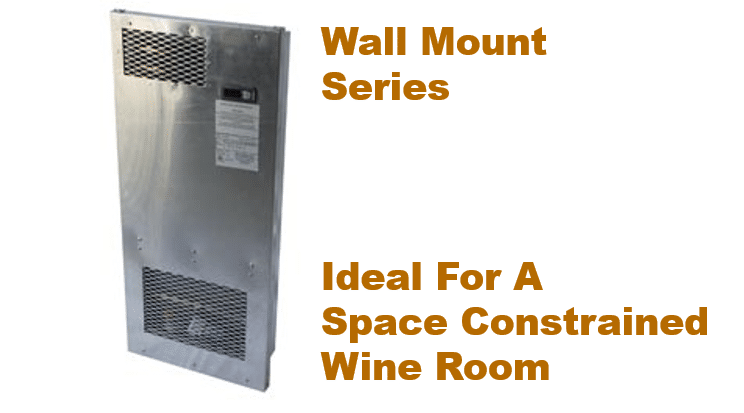 The Wall Mount cellar cooler units are the ideal solution for maintaining a consistent wine storage temperature and humidity in a space constrained wine room. This refrigeration unit is mounted vertically between studs on the wall. The installation process of this unit is similar to a through the wall system; however, the WM Series does not require exhaust, and only protrudes about an inch into the wine storage space. 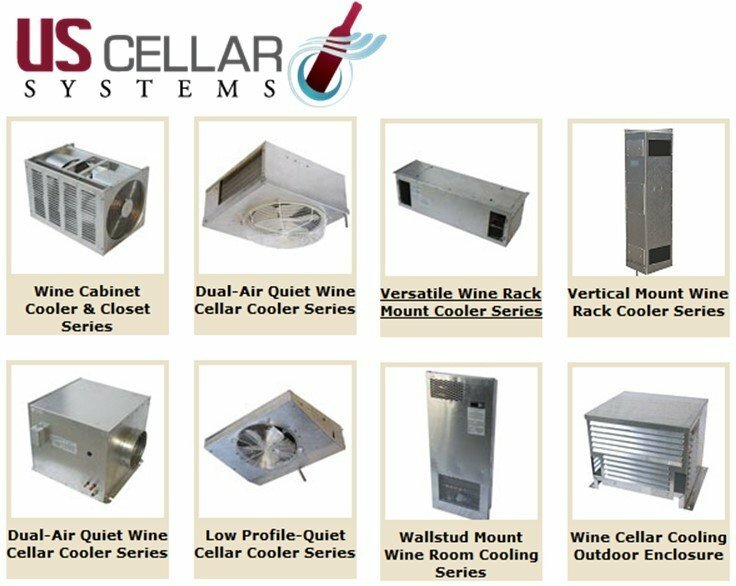 US Cellar Systems’ wine cellar refrigeration units are top of the line wine cellar climate control systems that are ideal for all applications, from home wine cellars to hospitality wine display rooms. Contact us now for service requests.